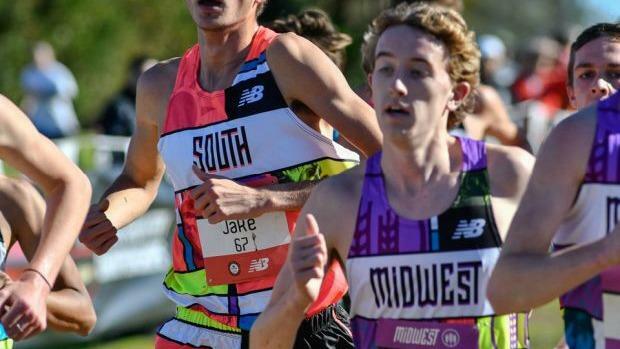 From the moment the gun went off at historic Balboa Park, the Midwest squad appeared a bit sluggish. Thankfully two of its aces sprung into action within the half-mile as Josh Methner of Hersey (IL) and Cole Hocker of Indianapolis Cathedral came through in 2nd and 3rd place at 2:17. The rest of their team back in the pack as Ares Reading of Niwot (CO) was in 8th, Drew Bosley of Homestead (WI) was in 17th, Carter Solomon of Plymouth (MI) was in 21st, Brendan Favazza of Clarkston (MI) was in 24th, Ethan Kern of York (IL) was in 29th, David Vannucchi of Luther (WI) was in 31st, Zachary Stewart of Brighton (MI) was in 32nd, and Evan Bishop of East Grand Rapids (MI) was in 36th. Maybe the guys just were relax the first mile, got boxed in at the start or something because it was very different from the girls race that saw them have their top five through in the first five places at the half mile. The Midwest knew they had to do something about this positioning and in the next half mile, a lot of their runners moved up. Methner decided to take his turn leading the pack during this portion coming through mile one at a 4:48.4 with Hocker not far off of him in second with a 4:48.5. Still there was no big move by any runner in the race up to this point. The entire pack was about six seconds within each other. The first move of the race happened right after the first mile as a pack of about 12 runners took off a bit. Methner was still leading at this point coming through the first half at 7:16.0. Hocker fell a bit back here but still close behind with a 7:16.7. Jake Renfree of Knoxville Catholic (TN) was leading the chase pack behind Methner with a 7:16.4. It was really the same race through the 2-mile mark until Renfree and Hocker decided to make their move on the field with about a half mile left in the race and the two came through the 2.5 marker at 12:24.8 for Hocker and 12:25.1 for Renfree. The put around two seconds on the field which set up a great finish between the two runners. At the 3 mile mark, it was only the two as they had a 9 second lead on Methner who was in 3rd place at the time. Hocker threw down one of his famous kicks, dropping Renfree in the process to win his first ever national title with a 15:13.70. The Midwest ended up winning the team battle with a score of 25 points. They had a total five all-Americans as Hocker won, Solomon took 4th, Bosley took 5th, Methner took 6th, and Bishop took 9th. Also, congrats to other midwest runners Stewart who took 17th, Reading who took 19th, Favazza who took 27th, Kern who took 35th, and Vannucchi who took 37th.